Wow – can’t believe that 2015 is almost over. It has been an amazing year of so many firsts and I can’t wait to see what 2016 has in store. But before we ring in the New Year, we need to settle on some sparkly beverages to serve at our New Year’s Eve Party. First contender? This sparkling hard cider cranberry cocktail. It is easy to make and it looks great too. 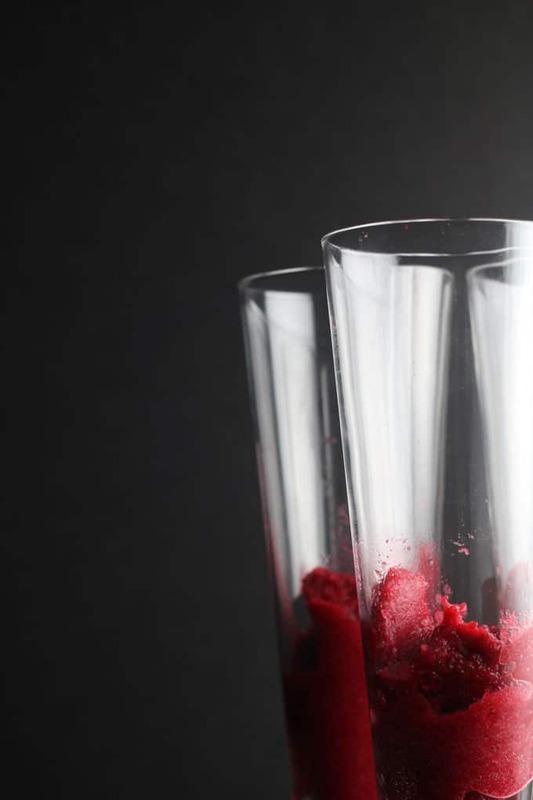 First, you will need to make your own cranberry puree and freeze it – it kind of reminds me of sorbet. And quite frankly, if you could get your hands on some cranberry sorbet it would absolutely work in this recipe but I’ve never seen it for sale. I’ve always made my own cranberry sorbet. The cranberry puree is actually a bit easier to make as it requires no boiling and is made in the blender….in my case, the Vitamix Pro 750. Just don’t forget to make it ahead and freeze for 6-8 hours. Suggest making this today and it will be nice and ready for tomorrow night’s festivities. Once frozen add a scoop (or two) to each glass. The puree recipe below will make enough for ~6 drinks. This drink has the most beautiful colour. Now for the really easy peasy part. 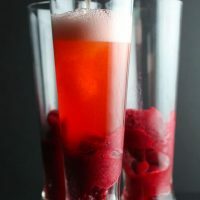 Add sparkling cider (I use an alcoholic cider) but you could easily substitute with a non-alcoholic cider and/or sparkling wine for a mocktail that is suitable for all ages. No need to leave the kiddos out of the celebration. Then give the drink a little stir and you are ready to raise your glass to toast the New Year. See, that was super easy. 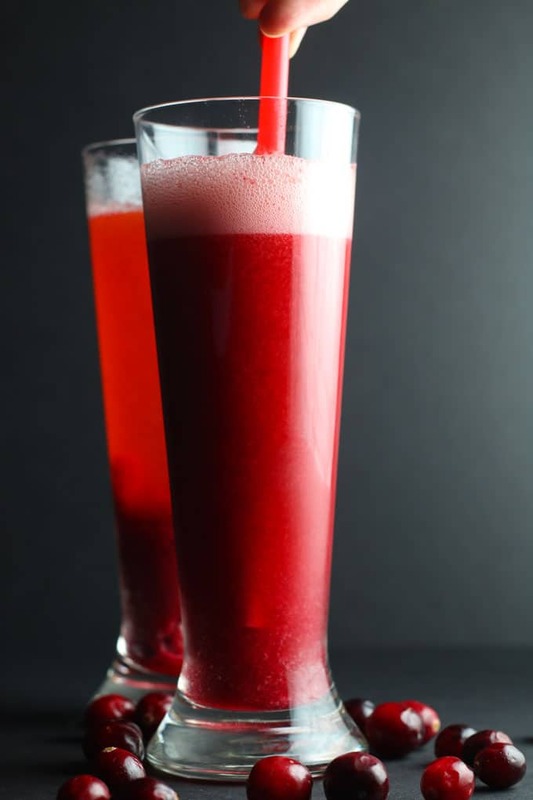 I love the flavours of cranberry (with a hint of raspberry in the puree) mixed with the apple cider and I’m certain that you will too. I’ll be back in the New Year with some easy smoothie recipes to get you back on track after the holidays. ‘Till then – stay safe and warm and dream of this tasty hard cider cranberry cocktail. Add all puree ingredients to the blender and blend until the mixture has a smooth consistency. Transfer to a sealed container and freeze for 4-6 hours. 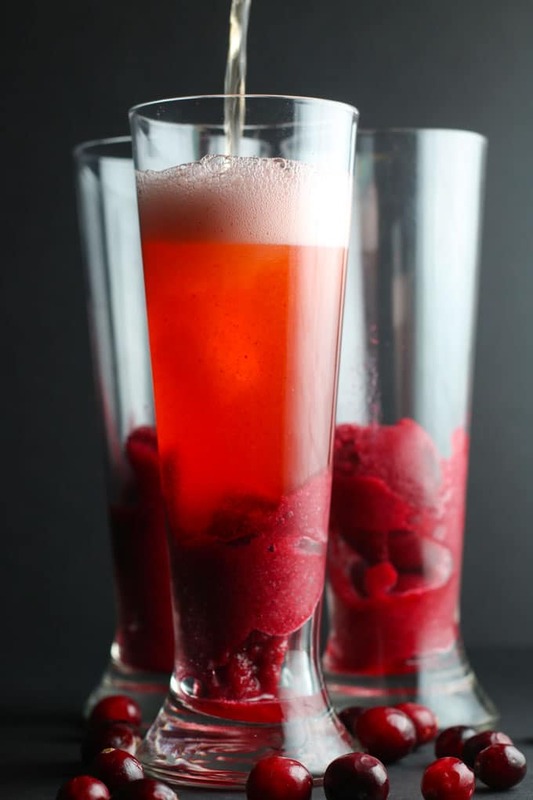 When ready to serve, add a scoop of the frozen fruit puree to each glass and top with cider. Try non-alcoholic sparkling cider for a great mocktail for all ages. Wow! This looks SO easy and so delicious! I’m definitely going to try to make this drink this winter. Thank you for such a great idea!